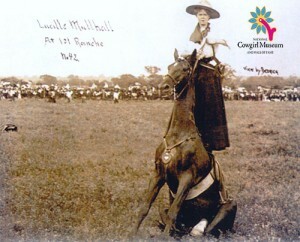 Lucille was the best known Western performer of her era and was identified as a “cowgirl” before the term was widely used. She learned to ride and rope on her family’s Oklahoma ranch, and began her career performing in her father’s Wild West show and later becoming one of the first and most accomplished riding and roping champions. Competing with, and frequently beating, male competitors in steer roping events, Lucille helped make women an integral part of rodeo.